MONTREAL -- McGill graduate Dr. James Naismith introduced his invention -- the game of basketball -- on Dec. 21, 1891. Basketball, a game that started with 18 men at the School for Christian Workers (later the International YMCA Training School, now Springfield College) in Springfield, Mass., has grown into a game that more than 300 million people play worldwide. The man who created this instantly successful sport was Naismith, an inaugural inductee to the McGill Sports Hall of Fame in 1996. Dr. Luther Gulick, head of physical education at the School for Christian Workers (later renamed Springfield College), asked Naismith to create an indoor game that would provide an "athletic distraction" for a rowdy class through the brutal New England winter. Naismith's invention didn't come easily. His first intention was to bring outdoor games indoors, namely, soccer and lacrosse. These games proved too physical and cumbersome. At his wits' end, Naismith recalled a childhood game, that he had referred to as "Duck on a Rock", that required players to use finesse and accuracy to become successful. After brainstorming this new idea, Naismith developed the game of basketball and its 13 original rules. The first formal game was played on December 29, 1891. That day, he asked his class to play a match in the Armory Street court: 9-versus-9, using a soccer ball and two peach baskets. Although he never had the opportunity to see the game become the spectacle it is today, Naismith's biggest thrill came when he was sponsored by the National Association of Basketball Coaches to participate in the ceremonial tip-off when basketball become an Olympic sport at the 1936 Summer Games in Berlin. A native of Ramsay Township near Almonte, Ont., Naismith was born on Nov. 16, 1861. Naismith was an intense student, collecting 11 academic degrees from the diverse fields of philosophy, religion, physical education and medicine. He competed in rugby-football, soccer and gymnastics at McGill University and graduated in 1887, among the top 10 in his class with a B.A. Honours in philosophy and Hebrew. Only 160 pounds, legends quickly grew on campus about his strength and agility. As a McGill sophomore in 1884-85, he volunteered to play centre in practice one day for an injured rugby-football player. Despite having never played before, he became an instant starter on the team and did not miss a game over the next three years. In 1885-86 he won the Wicksteed silver medal as the gymnastics champion of the junior class at McGill. In his graduating year, he won the prestigious Wicksteed gold medal as the top athlete in the senior class. He later taught physical education and became McGill's first full-time instructor of athletics before accepting a position at the YMCA College in Springfield, Mass., where he devised the rules to basketball. He also served as a Presbyterian minister. "He had a remarkable career - a career the likes of which probably no other Canadian ever has had," said former classmate Rev. W.D. Reid in 1939. Although Naismith became famous for his invention of a new sport, that stroke of genius never brought him fame or fortune during his lifetime, but he did attain enormous recognition following his death in Lawrence, Kansas on Nov. 28, 1939. The Naismith Memorial Basketball Hall of Fame was opened to the piblic in 1968 at Springfield, Mass., a tribute that forever makes James Naismith synonymous with basketball. 1861: Born on Nov. 6 in Almonte, Ontario, Canada. Son of John Naismith and Margaret Young. 1867 - 1875: He attended the grade school at Bennie's Corners near Almonte. 1873: After the death of both his parents, plus his maternal grandmother, he lives with his uncle Peter Young. 1875: Enters Almonte High School but less than two years later leaves his studies for four years. He returned and completed his high school equivalency in 1.5 years graduating in 1883. 1883: Enters McGill University in Montreal where he earns a BA in Physical Education in 1887. He participates in rugby, football, lacrosse and gymnastics. 1887: Enters the Presbyterian College of Theology in Montreal and obtains a diploma in 1890. 1890: Departs for the USA and Springfield College in Massachusetts. 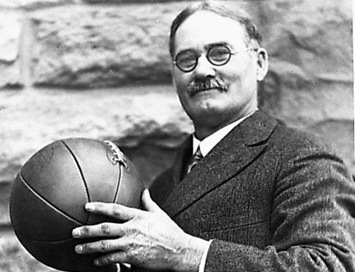 1891: On Dec. 21 "Basket Ball" is introduced to James Naismith's class. Following brief scepticism, the game is a hit before the students depart for Christmas break. 1892: Basketball becomes an instant success: so successful in fact it is published in 'Triangle' magazine under the title 'A New Game'. In January, Frank Mahan, one of his students, suggests the game be named 'Naismith Ball' but Naismith declines. 1894: On June 20 Naismith marries Maude E. Sherman from Springfield. The couple will have five children: Margaret Mason (1895), Helen Carolyn (1897), John Edwin (1900), Maude Ann (1904) and James Sherman (1913). Together with Gulick he publishes the rules in the "American Sports Publishing Company". 1895: Moves to Denver to become PE director at the YMCA where he'll stay until 1898. At the same time he is attending the University of Colorado Medical School (Gross Medical College) and graduates in 1898. 1898: Becomes director of the gymnasium, campus chaplain, and basketball coach at University of Kansas. 1910: Receives an honorary Masters degree in PE. 1911: Publishes "A Modern College". 1917: Nominated as YMCA Secretary and spends 19 months working in France. Returns in 1919. 1918: Publishes the "Essence of a Healthy Life". 1925: Takes American citizenship to meet government requirements after serving with the military. 1935: Under the NABC initiative funds are created from the contribution of coaches, players and spectators to send James Naismith to Berlin for the Olympics through the Naismith Fund. 1936: Inauguration ceremony in Berlin (April 7): A tribute from the organizational committee he throws the ball for the first match of the Olympic Games. 1937: His wife Maude dies. On March 3 he becomes Professor Emeritus in Kansas and retires at the age of 76 from the University. 1938: Receives the Legum Doctorate degree at McGill University. 1939: Honorary Doctor of Divinity at the Presbyterian College in Montreal (April): On June 11 he marries Florence Kincaid in Lawrence (Kansas): November 19: suffers a brain hemorrhage; November 28: dies of a heart attack aged 78 at his home (1515 University Drive) in Lawrence. 1941: Posthumously voted Life Member of Physical Education Instructors of America. His masterwork, "Basketball - its Origins and Development" is published by the Associated Press Basketball. He was a member of the Republicans and honorary president of the American Association of Coaches.